4.5 stars. What a fun surprise this book turned out to be. 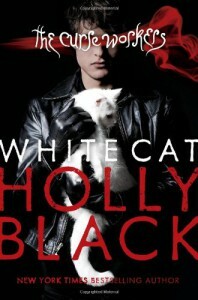 I was expecting a standard formula PNR, written in the gritty style that Holly Black seems to possess. White Cat was about as far removed from the typical angsty YA formula PNR as any other genre would be.I loved the curse worker world that Ms. Black built. I loved that the main character was a male, which isn't as common in the PNR genre. I especially loved the mafia family vibe that this book was putting out. Nothing about this book felt like the "same ole, same ole" that I've been reading all too much of lately.My previous experience with Holly Black's writing came in the form of her modern fairie tales series. I feel like her writing has much improved since she first wrote Tithe, and the shock value writing style that she likes to use didn't feel quite as forced in this book.I will definitely be reading on in this series and can't wait for the release of Red Glove!